A STRIP OF fabric was all that kept William Anderson from dying on an Overbrook sidewalk. "He was in bad shape when I got there - I could see the blood squirting from his leg," recounted Officer Tighe Wingrove, the first person to discover Anderson on Dec. 5 after he'd been shot in the right leg and abdomen during a botched robbery attempt. Wingrove, a former Army medic and EMT, did what hours of training had drilled into his mind: He applied a tactical tourniquet to Anderson's right leg to stop the bleeding and buy the badly wounded man some extra time until medics arrived. "The doctors [at the Hospital of the University of Pennsylvania] said using the tourniquet definitely saved his life," said Wingrove, who works in West Philadelphia's 19th District. Had Anderson been shot just two days prior, he likely would've bled out on that sidewalk on 63rd Street, with Wingrove helpless to do much more than watch over him. That's because two days before the shooting, Wingrove received his department-issued tactical tourniquet - one of 5,000 distributed to patrol officers as part of a new Police Department initiative. "I'm very happy the department is giving us these," said Wingrove, who's up for a commendation for his lifesaving efforts. "It's a simple tool that really works; this is a good decision overall." Wingrove can credit police Chief Inspector Joe Sullivan for that decision. Sullivan, who oversees the department's Homeland Security and Counterterrorism units, brought the tourniquets to Philly after talking with members of the Boston Police Department, whose officers started carrying them in the wake of the Boston Marathon bombings in April. During those horrific attacks, first responders and police officers weren't carrying tactical tourniquets and had to improvise on the fly. The impromptu tourniquets they used were effective, but limbs - and lives - were still lost because personnel were underequipped, Sullivan said. "[Tourniquets] are certainly nothing new - the military's been using them for decades," he said. "Unfortunately, we saw what Boston was, and it looked like a war zone. "This was a wake-up call for first responders across the country to be prepared to do whatever it takes to save lives." For police, Sullivan said, that sometimes includes providing basic medical care, especially at fresh or potentially unsafe crime scenes, when medics have to wait for the all-clear to render aid. "The Police Department isn't trying to replace EMTs," Sullivan said. "But situations like Boston and the Aurora [Colo.] theater shooting have shown us that there are times when officers are the only ones around. We have to adapt to survive, so that's what we're doing." Once the decision was made to secure the tourniquets, bringing them to Philly was easy, Sullivan said. Each district sent officers to the department's training session, a four-hour, hands-on clinic. A few hours is all it takes to learn how to use a tourniquet, which factored into why every patrol officer is now carrying one. "Part of my job is making sure our department is properly equipped to handle any emergency," Sullivan said. "These tools require minimal training, are easy to use and can absolutely save lives. This was a no-brainer." 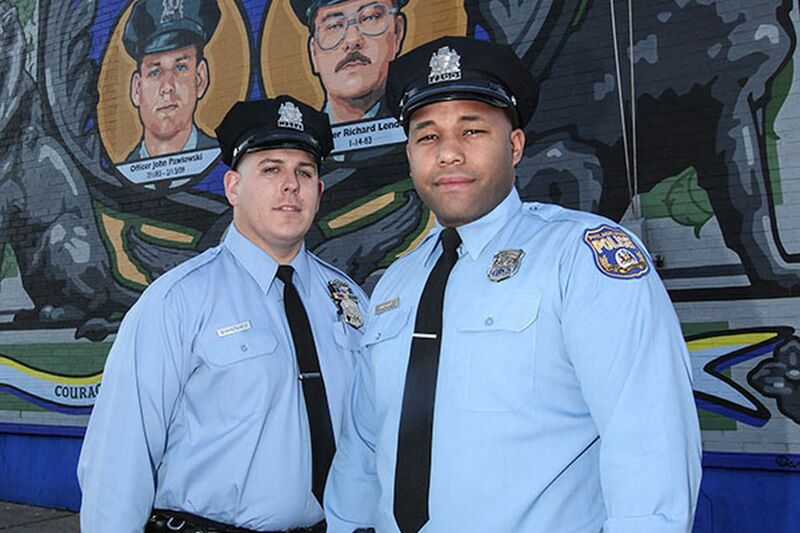 No one can attest to that more than Officers Brandon Bryant and David Quaintance, who used a tourniquet to save the life of a man in Ogontz's 35th District. Unlike Wingrove and his prior medical training, Bryant and Quaintance had only their four hours of department training to support them. In that Nov. 25 incident, Bryant and Quaintance responded to a house in Fern Rock where Francois Marquis, 58, had fallen from the roof and suffered a serious fracture to his leg, according to police paperwork. By the time the officers arrived, Marquis had lost a significant amount of blood, and time was running out. "I just jumped into action," said Bryant, who had just been given his tourniquet three days prior - the 35th's officers were issued theirs before their colleagues in the 19th. "I didn't have time to be nervous. The only thing I was thinking was, 'I have to preserve his life.' "
That's exactly what Bryant's application of the tourniquet did: After he used it to stem the heavy bleeding from Marquis' leg, the man was taken to nearby Albert Einstein Medical Center, where he was stabilized. "We knew we would use them. We just didn't think it'd be in the same week that we got them," Quaintance said. Like their fellow officer in West Philadelphia, Quaintance and Bryant are up for commendations for their quick thinking, which hospital staff at Einstein told them "certainly saved" Marquis from bleeding to death. In fact, to hear experts tell it, there's little risk - and major gain - involved in officers' use of tourniquets in the field. "With all the data out of the Middle East, it's clear that tourniquets are a great way to stop bleeding in an austere environment, which can also include an isolated urban block," said Dr. Dan Holena, a trauma surgeon at the Hospital of the University of Pennsylvania. Holena said the old fear of tourniquet use leading to amputated limbs isn't sound - the tourniquet would have to be left on "for several hours" for that to happen, he said, which isn't likely for victims of shootings or other serious injuries in a city. "The bottom line is that this is a great application in Philly, where penetrating trauma is common," he said. "I've already seen here that tourniquets have saved lives, and I support the department's decision 100 percent." So do the officers who've already used them to save lives. "Everyone should have one of these," Wingrove said. "Put it in your car next to the jumper cables. You never know when you'll need it."